"This bean salsa is great for any occasion. It is quick and can be brought to a summer picnic without spoiling!" 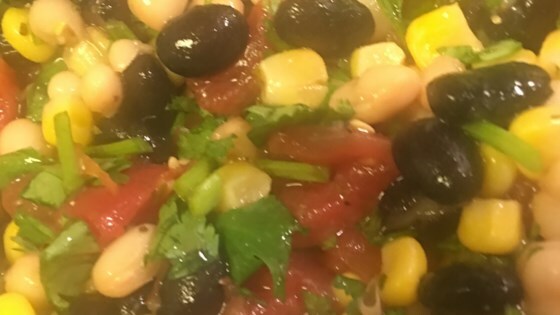 Mix black beans, garbanzo beans, corn, tomatoes, bell pepper, salsa, cilantro, lime juice, jalapeno pepper, salt, garlic powder, black pepper, cumin, and onion powder together in a bowl. Salsa can be mild, medium, or hot depending on your taste. I made it for us two and it was way too much though tasted good. We loved this. Light and fresh. We skipped the salsa, no need for it. Tastes better the longer it sits. I have tasted this recipe and it is delicious, one of the best I've had and better than my own! Will definitely be making this at home. Looks easy!